Women from all cultures, ages and socio-economic groups are affected by domestic and family violence and sexual assault, but the extent, nature and impact is not evenly distributed across communities in Australia. Women from diverse backgrounds are disproportionally affected by violence. The differential nature and effects of this violence is often compounded by various forms of marginalisation for diverse groups of women such as Aboriginal and Torres Strait Islander, culturally and linguistically diverse and women with disability. Invisible women, invisible violence establishes the state of knowledge about the experiences of domestic and family violence and sexual assault among women from diverse groups. Reviewing existing knowledge and data on the experiences of violence and identifying key gaps in data as they relate to diverse women, it also affirms the more complex message that, while we know there is disproportionate impact, the exact nature and scale of this difference is extremely difficult to quantify. Mitra-Kahn, T., Newbigin, C., & Hardefeldt, S. (2016). 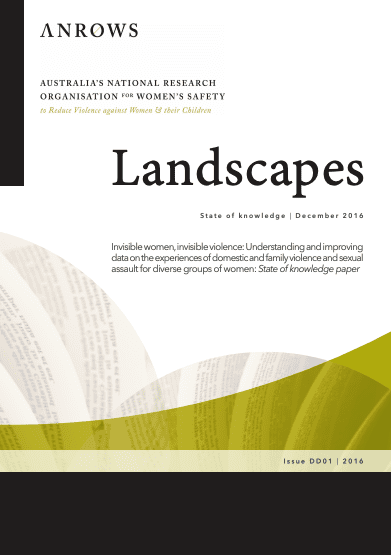 Invisible women, invisible violence: Understanding and improving data on the experiences of domestic and family violence and sexual assault for diverse groups of women: State of knowledge paper (ANROWS Landscapes, DD01/2016). Sydney, NSW: ANROWS.